Bored with oatmeal? Try this. I love oatmeal. I always make a double serving of 5 minute rolled oats (as in 1 cup dry) and typically eat the whole thing. On days I eat oatmeal for breakfast, I sometimes forget to eat lunch because it’s so filling and satisfying, it keeps me going until late afternoon, sometimes even dinner time! 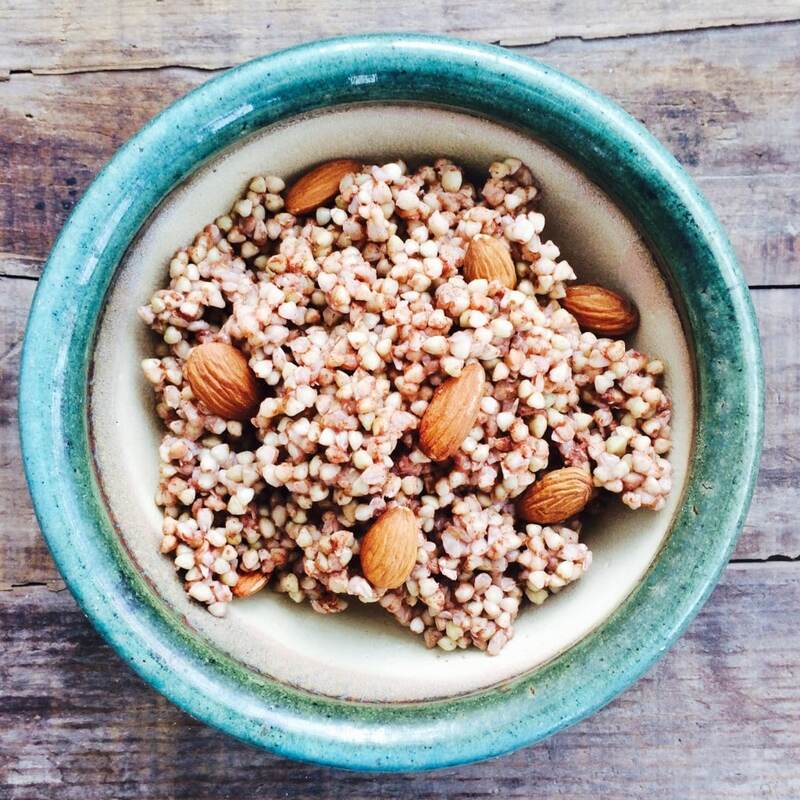 But, in an effort to switch it up a little, I’ve been experimenting with buckwheat lately. It’s neither a grain, nor related to wheat, but rather the seed of a plant related to rhubarb, and is 100% gluten-free. And it is delish. I prefer to keep the seed whole instead of grinding it, as some recipes call for. You can make is savory or sweet, but at the request of a client who can’t eat fruit, I wanted to create a fruit-free breakfast bowl. This is so simple and fast to make, and a great alternative to oatmeal. I find that despite it being a complete protein (23 g per cup, which is about half of your daily needs) and super high in fiber (17g per cup which may be more than some people eat in a year!) I find it to be a little on the lighter side in terms of satiety. You will find buckwheat most typically in the bulk section, but Bob’s Red Mill also has it pre-packaged. 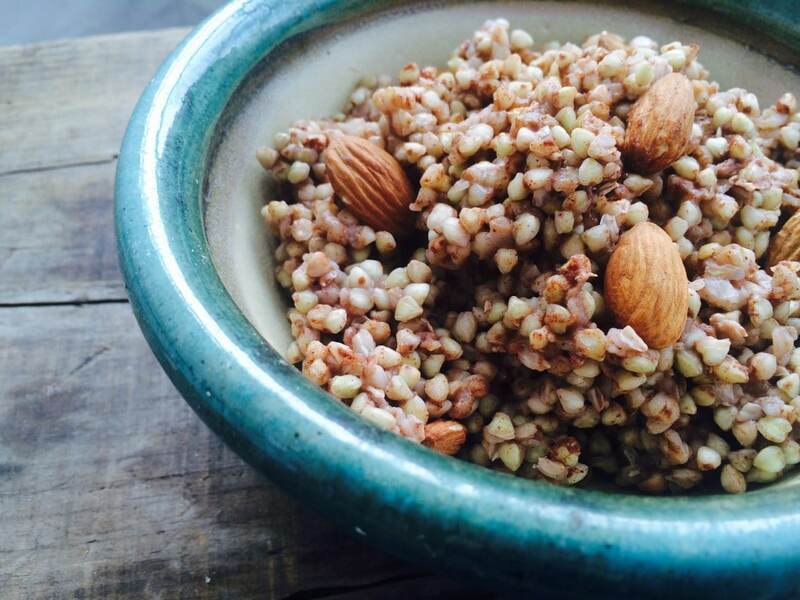 Check out the recipe below, and please share your favorite buckwheat toppings in the comments! I am new to using it, and would love some ideas. I created the guide based on the popularity of my grocery store tours, which I typically give at least once a week. Everyone who does the tour, usually sends 2 or 3 other friends to do it as well, so I don’t even advertise it on my website, but am always busy with them. In fact, I gave one to Ivanka Trump last summer, and she recently requested I bring her entire team on one! So it’s quite popular, eye-opening, informative, and extremely useful. It’s jam packed with everything you need about grocery shopping and will save you both time and money when it comes to shopping for healthy and organic foods. It’s also designed to get you excited about eating healthy, with an encyclopedia of close to 100 fruits and vegetables so you can understand their benefits, from anti-aging, to weight loss, to cancer prevention plus how to choose, store and prepare them so that you never go home with brown avocados or tasteless fruit again. It will be released on May 18th, and you can pre-order it now. Bring water to a boil, add buckwheat, and cook about 10 minutes, until all water is absorbed. Remove to serving bowl, sprinkle with salt, cinnamon, and almonds. Enjoy!